With its head concealed, the elk considers itself hidden, but Don Wackerman immediately spots its rear poking out from a bush about 500 feet away from him. A Wyoming native, Wackerman has led fly-fishing expeditions in the Northwest and guided elk hunts across the Southeast. Now, in the mountains of Bell County, Kentucky, Wackerman is the sole caretaker of elk in a multi-million dollar project to create a wildlife refuge in the heart of coal country. The Appalachian Mountains border the refuge, which is leveled and depressed by the first mountaintop-removal mining operation in Kentucky. In worn-out jeans, a thick button-up shirt, rustic vest and his signature white cowboy hat, Wackerman hops into an all-terrain vehicle and hurdles along winding, dirt paths that will soon become 20 miles of two-lane, paved roads. Most days, he is alone on the land that supporters hope will draw more than 850,000 tourists a year within five years of the refuge’s anticipated opening in April 2020. Wackerman says he’s made his living off tourists in Jackson Hole, and he tells people in Bell County to start developing plans to capitalize on a potential tourism boom now. But promises of an economic boost through tourism seems inconceivable to many in the mountain county, shaped and sustained by mining for centuries. “All they know is coal,” Wackerman says. Coal drove the economy of Bell County for over 200 years. When the industry declined in the 1990s, the subsequent loss of high-paying mining jobs devastated Eastern Kentucky — now designated as one of the poorest regions in the U.S. In Bell County, 37 percent of residents live below the poverty line. Today, members of the local community and beyond seek to restore the land from mining and revitalize the economy through tourism. But in a long-exploited region of people to which many promises were made and rarely kept, some are waiting to see the effects of tourism before they get behind it. “Barney,” a 2-year-old elk at the wildlife refuge, shows off his first pair of antlers. “He’s pretty proud of them,” said Don Wackerman, site manager. Wackerman led elk hunts for decades, and he is now settling into his new role as a caretaker for the elk at the refuge. In 1775, he led in the westward expansion of the U.S. by guiding settlers through the Cumberland Gap, a pass from Tennessee into a region now designated as Bell County, Kentucky. The route cut through the steep Appalachian Mountains, a 600-miles-long, 150-miles-wide barrier to mass migration from the East. After leading the group of 50 settlers safely through the pass, Boone settled about 100 miles north of the Cumberland Gap in Boonesborough, Kentucky. Near the end of the 18th century, Bell County again aided in the growth of the U.S. by supplying coal to power the railroad and major Midwest factories. The first commercially-produced coal from Eastern Kentucky dates back to 1790, but the industry truly began to boom after the Civil War, when speculators leased land for massive mining operations. Job opportunities drew Irish and Scottish immigrants, black Americans from the South, and some Shawnee to live and work in shantytown mining communities, like Fourmile. The day after Christmas in 1945, an explosion at a Straight Creek Coal Company mine in Fourmile trapped 31 men and took 25 lives, according to the final accident report by the Bureau of Mines. Ignited methane dust set fire to coal dust, which engulfed most of the mine in flames. But the accident might have been preventable. Federal mine inspections in 1943 and 1944 found unregulated coal dust at levels that could support an explosion. However, “no changes of practices or conditions” to alter the dust levels in the mine occurred between the last inspection and the 1945 disaster. In the aftermath of the explosion, widowed mothers and sick and injured men struggled to maintain a living at Fourmile, where the negative ripples of the tragedy continued to unfurl for decades after the incident. 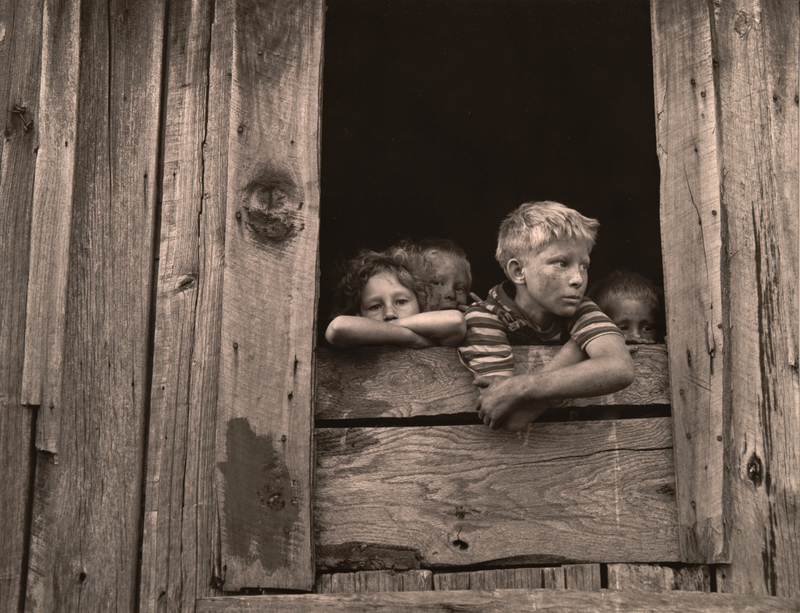 Lucy, Joe Albert, Harold and Alvin Jones look out of their kitchen window at their home in Fourmile, Kentucky. In September 1946, photographer Russell W. Lee documented the medical, health and housing conditions in Eastern Kentucky coal communities while on assignment for the Navy. Lee visited Bell County in the aftermath of the December 1945 mine explosion at the Belva mine in Fourmile, and he noted its lasting toll on the community. “The widows have no panes; the door frames have no doors,” Lee wrote. Photo courtesy the National Archives. The effects of coal mining remain etched in the landscape of Bell County, which bears the first mountaintop removal site in Kentucky, an expansive sludge pond, and a contaminated stretch of the Cumberland River. The river flows a fluorescent green near Fourmile, which has lacked proper sanitation systems since the 1940s. Eastern Kentucky coal production peaked in 1990, and it has since declined by 87 percent. Between 2015 and 2016, Kentucky coal production decreased by 30 percent, an output of 42.9 million tons — a yield comparable to production in 1922, according to Kentucky Coal Facts. Production dipped due to accessibility issues with hard-to-reach ribbons of coal in Appalachia, which struggled to compete with western Kentucky and western states with easier-to-access coal, according to an economic policy report by the Federal Reserve Bank of Cleveland. Emissions regulations laid out in the Obama administration’s Clean Power Plan also drove a drop in coal production, as the demand for coal-fired power plants decreased in favor of cheaper alternatives, like natural gas. Employment in Eastern Kentucky coal mines declined by 92 percent since employment peaked 70 years ago. That accounts for a loss of about 900 jobs a year since 1979. In Bell County today, 383 people work at coal mines — down from 1,459 workers in 1990, its year of peak coal production. The population of Bell County — currently 27,894 residents — has declined by 12 percent since 1990. As high-paying coal jobs disappeared, many Bell County natives moved to larger cities in search of a comfortable income. The national average income for all coal mining occupations is $60,100 per year, according to the Bureau of Labor Statistics. The average household income of Bell County residents is $22,603, while the national average is $55,322. The loss of high-paying coal jobs has impacted all levels of the local economy, and made it difficult for the county to recover from the recession. Bell County is a designated “distressed county,” and it is located in the poorest region in Kentucky and one of five poorest regions in the U.S., according to the Appalachian Regional Commission. Recently, the county has also been hit hard by the opioid epidemic. Bell County is one of the top five counties in Kentucky for drug overdose deaths per capita, according to a 2016 report from the Kentucky Office of Drug Control Policy. But beneath the poverty and social issues remains the resiliency of a population forged through a legacy of hardship — from pioneers who braved the wilderness to search for a better life, native tribes forced off their ancestral soil, and immigrants who ventured into dangerous coal mines to put food on their families’ tables. And beneath the people remains the land, which mining companies coveted for its richness in resources and Daniel Boone deemed an uncharted “paradise” — a land of boundless opportunity and promise. Spliced in the rugged mountains in southern Pineville, a Shell gas station borders the turnoff to East U.S. 119. The route follows the Cumberland River, which dilutes from its unnatural emerald shade to a muddy brown with each passing mile. Along the bank, pockets of houses shaped like cargo shipping containers perch haphazardly. The railroad lines the river on the other side, and the steep Appalachian Mountains rise above it. About 7 miles past the turnoff, beyond three budget grocery stores, an elementary school, a tiny U.S. Post Office, and the Bell County Volunteer Fire Department, a bridge connects the highway to a plot of grassy, sloping land. The bridge balances high above the gushing Cumberland River. A massive “Rand Paul for U.S. Senate” billboard obstructs the view of the bridge from the roadway, but that’s not why every car speeding along the rural drive passes by it. The bridge leads to the 12,000-acre plot of land occupied by the wildlife refuge. Almost 50 years ago, the land was used in the first, large mountaintop-removal mining operation in Kentucky. Pineville company Asher Land & Mineral mined the land, but when the mines closed in the 1970s, they restored the land and sold a portion of it to a company for use as an industrial site. The company built the bridge to connect Pineville to the future development, which promised jobs to the surrounding Bell and Harlan counties. The project never panned out, but the bridge remained, extending into a dead-end road and miles and miles of land bearing the scars and ghosts of failed industries. Jon Grace, Bell County tourism director. Initially, many residents felt hesitant about opening up an ATV park to tourists from outside the region — a sentiment that grew out of a history of exploitation by coal and timber companies, Grace said. From 2008 to 2016, the Wilderness Trail Off-Road Park hosted events in the fall that attracted up to 12,000 people from 31 states, Grace said. ATV riders used the dirt trails winding through the mountains and riverbanks for free, and families and friends often camped out on the land. “You could see ATVs and trucks and trailers for miles and miles and miles,” Grace said. Bird’s eye view of Wilderness Trail Off-Road Park in Bell County, taken from a drone. Photo courtesy Jon Grace. Grace, who became the tourism director for Bell County in 2016, hopes the county will become “the outdoor recreation capital of Kentucky.” He said the tourism office maintains a small budget, so he uses cost-effective methods, like web and social media-based advertising, to drive visitors to Bell County. At the state level, marketing efforts remain among the lowest funded in the 50 states, even though the economic impact of tourism in Kentucky has grown each year for the last 10 years. In 2016, tourism contributed $41 million to Kentucky’s economy — more than either coal or agriculture, according to the Kentucky Travel Industry Association. In late March 2018, Grace submitted a formal proposal for an even bigger ATV park at a 47,000-acre plot of land owned by Molpus Hardwoods, a timber investment firm. The intended 300 miles of trails on the land are projected to wind through parts of Bell and Knox counties in Kentucky, as well as two counties in Tennessee. Grace said it’s difficult to secure funding for major projects of this kind, but he believes it’s critical to open new trails to provide locals a place to legally ride and continue to grow the economic impact of visitors to the region. In 2016, the Wilderness Trail Off-Road Park closed when Asher Land & Mineral decided to lease the land to the Appalachian Wildlife Foundation (AWF), a Corbin-based nonprofit seeking large, continuous acreage for a wildlife conservation refuge. Grace said he was “as mad as anybody” when he first found out that the AWF had taken over the lease for the land. Grace said some people in the community remain opposed to the wildlife project because they are used to seeing projects fail, and many people won’t back an initiative until they see it physically take form or create positive outcomes. Randy Hammontree works as a firefighter at the Bell County Volunteer Fire Department a few miles down the road from the wildlife refuge site. He said he thinks the property should have been left the way it was, before AWF leased it for their project. Hammontree said people in Bell County enjoyed riding ATVs, fishing, hunting, going on picnics, and savoring the wildlife of their county freely on the land. “All of the free access for families was stripped from the locals and more or less being turned into a ‘pay-to-visit’ type of thing,” he said. Hammontree said he thinks Pine Mountain State Park, located in Bell County, should be used for elk viewing, and he thinks bird watching on the land was fine without being regulated. At the Cumberland Gap National Park visitor center in Bell County, Brittony Beason seemed doubtful the wildlife refuge project would be completed. A park ranger, Beason is a native to the region with a degree in Appalachian History from Southeast Kentucky Community and Technical College, located in Cumberland, Kentucky. Bell County native Emily Ayers, a success coach for the Eastern Kentucky Concentrated Employment Program, said regional culture plays a role in the community’s attitudes toward tourism, especially in response to outside companies buying up land for their own ventures. She said the community values living off the land and doesn’t place a heavy emphasis on making a lot of money, which contributes to the lack of local entrepreneurial ventures in response to the influx of visitors to the ATV park, and soon, the wildlife refuge. In mid-March, Appalachian Wildlife Foundation CEO David Ledford stood at his desk near the floor-to-ceiling window of the AWF office in Corbin as he took a phone call. Pockets of snow from a morning shower hid safe from the sun in the shadows of the building’s overhang. The office space was modest and minimally decorated. A small, wooden elk statue rested on a pedestal at the entryway into the conference room, where a map of the land for the Bell County wildlife refuge spanned across one wall. Ledford took his seat at the expansive conference table. He was the only one in the office that day as his business partner, board chairman Frank Allen, was elsewhere. But Ledford possessed a certain bold and direct presence that filled the room. Originally from Tennessee, Ledford has lived all over the U.S. and the world while working as a wildlife biologist. He eventually settled in Kentucky to continue work on a major initiative to restore elk populations in the Appalachian Mountains. He left that project to start the AWF in 2009, and he began work on a program that created incentives for coal companies to improve performance measures related to ecological restoration and wildlife conservation. In 2013, the AWF switched gears and focused its efforts on the wildlife refuge project in Bell County. They modeled the project after the Elk County Visitor Center in Bennesett, Pennsylvania, a much smaller, 250-acre conservation range. Ledford said he checked out several potential sites for the refuge in West Virginia, Tennessee, and other Kentucky counties, such as Martin, Pike, Knott, Breathitt and Perry counties. But despite many large, wild landscapes in coal country, buying up large chunks of land is a challenge due to the often fractured ownership. He found one plot of land with elk on it, but it had 50 different landowners, 20 different people who owned the mineral rights, an owner of the natural gas, an owner of the timber estate, long-term leases with coal companies and unreclaimed pieces of land, Ledford said. He said the 12,000-acre plot in Bell County was a lucky find, with restored mineland, some of the highest peaks in the Appalachian mountain range, and Asher Land & Mineral as its single owner. “It took all those confusing issues away, and it happened to be the prettiest piece of land — it’s gorgeous,” he said. 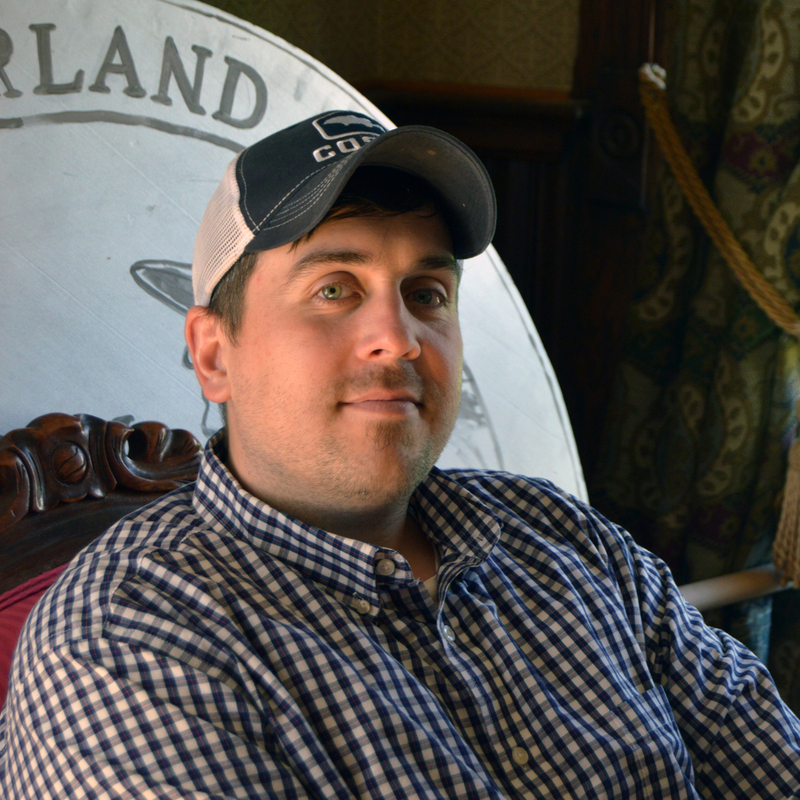 Nick Reel, general manager at Asher Land & Mineral, said the company leased to AWF primarily because of the potential economic impact on the region. He said Asher Land & Mineral also wanted to show that a previous surface mine can have future uses. The land currently hosts a range of wildlife, including 260-280 species of birds, black bears and whitetail deer. But the main attraction will be elk, as they best acclimate to tourists, Ledford said. While elk are indigenous to the Appalachian landscape, overhunting and habitat destruction virtually wiped them out in the mid-1800s. The Fish and Wildlife Resources Commission started a program in the late 1990s to bring them back, and now the state’s herd numbers about 11,000, according to the Kentucky Elk Report. 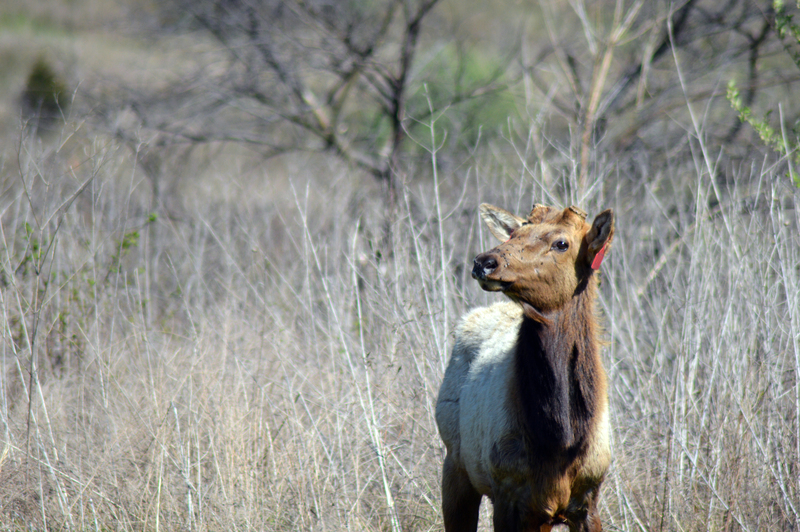 This past winter, the AWF contracted with a company from out West to capture elk in nearby counties and relocate them to the wildlife refuge by helicopter. 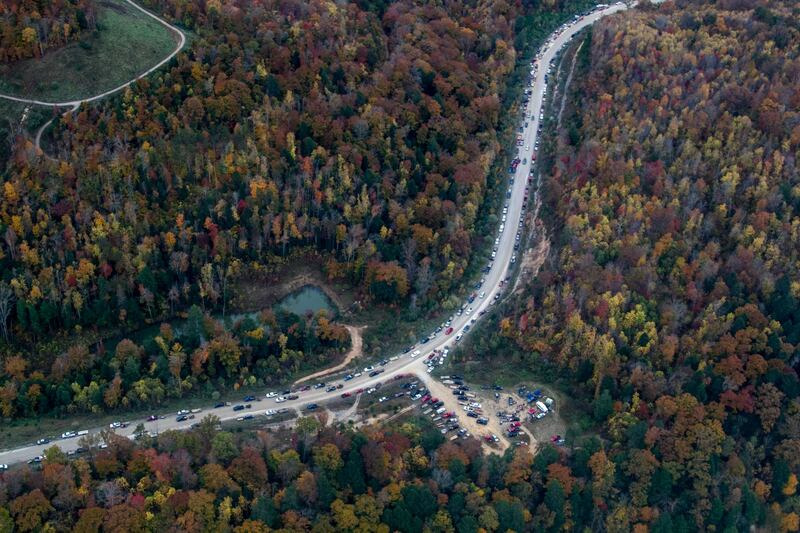 It was a sight to see: elk dangling from choppers, flying high above Kentucky hollers to their new home. Once they got there, workers tagged them, took blood work and put them in a pen until they settled down from post-flight stress. Ledford said this is the most humane method of transport, if unconventional. 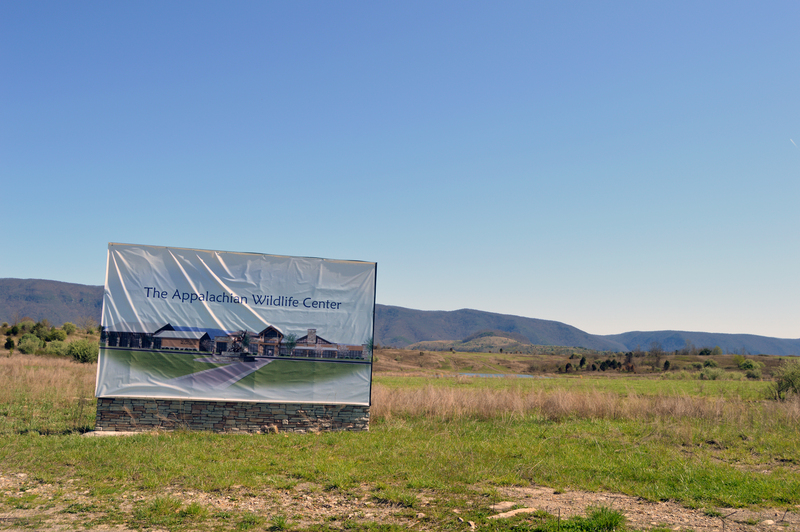 The AWF also plans to build an Appalachian Wildlife Center on the property. Construction begins in June for the center, which will feature an artisan shop, a restaurant, a theater, a hall featuring research on birds, and a museum dedicated to educating visitors about mine land restoration and conservation. “It’ll be an educational resource for the heart of coal country on par with the Smithsonian, but also this living lab for kids being able to go out and see things that are all around them but they’ve probably never even thought about before or taken for granted,” he said. Ledford said the center will create 167 new jobs, but most of the regional job creation will derive from the expected 851,000 visitors a year within five years. He said this visitorship will generate a $180 million regional economic impact and lead to 2,500 new hospitality jobs in the seven poor, surrounding counties struggling with the decline of the coal industry. Visitors to the wildlife refuge will pay about $18 per person for entry, Ledford said. While he hopes residents from Bell County come to the refuge, he said with such a small population, it won’t affect the projected visitorship if locals choose not to come. The total budget for the project is $34 million, and Ledford said the AWF has currently raised almost the entire amount. The nonprofit received $12.5 million from the Abandoned Mine Land Pilot Program (AML Pilot) in 2017, and the Appalachian Regional Commission afforded $1.8 million. The rest of the money came from other foundations, private donors, and organizations, including $100,000 from the Bell County Tourism Commission. The AML Pilot, administered by the Office of Surface Mining Reclamation and Enforcement (OSMRE), provided $30 million last year to each Kentucky, Pennsylvania and West Virginia — three Appalachian states with the largest number of abandoned mines considered a severe threat to public health. In addition to the wildlife refuge, five other projects in Kentucky received a portion of the $30 million. They spanned six counties in Eastern Kentucky and include an outdoor adventure park for mountain bikers, two industrial improvement projects and two professional development projects. The money used in the AML Pilot is derived from the U.S. Treasury. Rep. Hal Rogers, a Republican who represents southeastern Kentucky, and Senate Majority Leader Mitch McConnell, R-Kentucky, introduced the AML Pilot in 2015 to supplement money states receive from the AML fund, which is intended to reclaim mine sites abandoned before 1977. Coal companies have paid $9.2 billion in fees over the last 41 years to the AML fund, which has accrued $1.5 billion in interest. About $4.3 million has been disbursed to states and Indian tribes for reclamation projects and about $2.5 billion has been disbursed for other uses, according to the Department of the Interior. In 2017, the AML fund supported 3,762 jobs in Appalachia and created an economic impact of over $379 million in the region. The fund maintained a balance of $2.4 billion as of September 2016, according to the OSMRE. The cost to restore the mines abandoned before 1977 in the U.S. is $10.5 billion — more than 4 times the fund’s balance. The cost to restore abandoned mines in Bell County is about $4 million. The fees coal companies pay into the AML fund have not risen with 41 years of inflation. The program to charge the fees expires in 2021, and then it’s up to Congress to choose whether or not to renew it. In March 2017, Rep. Rogers introduced the RECLAIM Act in the U.S. House of Representatives. The RECLAIM Act aims to accelerate $1 billion from the AML fund over the next five years to revitalize the economies of coal communities hit hardest by the industry’s decline. The legislation has not passed the House. “This bill represents a real investment in coal country — one that will provide much needed resources to clean up the environment, create jobs and strengthen these communities from the ground up,” Rogers said in a statement. Sen. McConnell introduced a similar bill in the U.S. Senate, but it did not include an amendment from Rogers’ bill that requires the public be notified during the project-planning process and be given the opportunity to engage in public meetings related to proposed projects. Kevin Pentz, a Berea-based community organizer for Kentuckians for the Commonwealth, has been working to get the RECLAIM Act passed. He said the community participation amendment is essential to the legislation. In March 2018, 16 judge-executives across Kentucky signed a letter that urged McConnell to see that the RECLAIM Act become a law by attaching it to the omnibus spending bill. But Congress did not include the act in the spending bill, which passed on March 23. Pentz said the biggest obstacle to getting it passed, in addition to McConnell, is the National Mining Association. 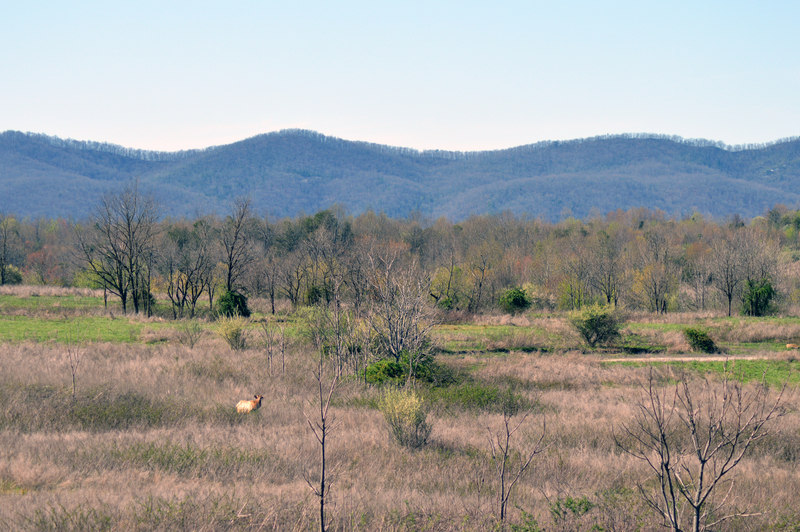 As the sun drifts low over the dusty Appalachian Mountains, elk at the Bell County wildlife refuge begin to emerge from their places in the shade to search for an evening snack. “What do you guys want for dinner?” Don Wackerman asks, laughing. It’s a serious question that he’s actively trying to solve. The elk won’t eat the grass on the restored mine land because the soil lacks certain nutrients they need in their diet. With help from biology students at Lincoln Memorial University in Harrogate, Tennessee, Wackerman documents the elks’ food choices in each season to determine the nutrients they need — data that hasn’t existed till now. It’s one symptom of working on an unprecedented project: the largest elk-viewing and conservation range in Appalachia, a region long-ruled by coal. Wackerman looks off as two elk leap together beyond the cusp of a distant ridge, and he marvels at the landscape, where, before the coal industry took hold, tangled wilderness proved a barrier to travel and settlement. Now, on land leveled by mining, indigenous wildlife recovers and swells with the coming of spring. Where hardship grew in dust and darkness, warm light now casts on a county’s next chapter. An elk stands alert in foliage at the site for the Appalachian wildlife park. Don Wackerman, site manager, refers to the 150 elk on the property as his children. He said he expects 40 to 50 births this May and June. “I’m going to be a grandad,” he said.